Google Finally Discontinued The Instant Search Results, Did You Notice? Google Instant, launched in 2010, and finally discontinued on 26 July 2017. Google will longer show the instant search results as you type in the search box. It came so quick, the news first revealed on search engine land is now spreading all over the internet and almost everyone in the search industry knows it by now. A feature that was called by Google a fundamental shift in the search is no longer to be seen while searching on the Google search engine. Since the mobile searches are growing in numbers and Google is already trying to go mobile first with its approaches, it’s a decision that would help them to focus more on mobile specific optimization. So, removal of a desktop specific feature may not come as a surprise here. Hopefully, it will make the searches coherent across all the devices. How would the searches be seen now? 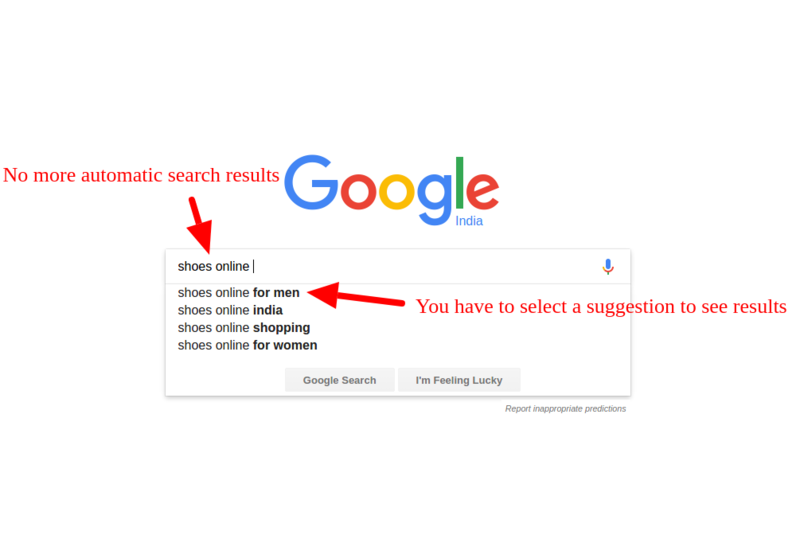 Don’t confuse the Google Instant results with the search suggestions. The search suggestions are still there. It is just that now, as you type in, the automatic results won’t be showing. You have to click on search suggestions or hit the search or enter button to see the search results. Finally, bringing the coherence between desktop and mobile search is what that Google says is the objective of this change.